Solar Pumping There are no products in this category. A solar pumping system is a pump system in which the energy source used is solar, that is, it is used a solar kit to provide power to the pump that moves the fluid in question. There are generally two types of solar pumps; one in which the pump is installed and appropriate for the kit to install solar panels, and therefore is a pump that operates with DC. Or a traditional AC pump is used and an inverter is used to transform the energy from the solar panels kit (could also be wind generators), which is DC power in AC power. The first of these systems is higher yielding, since the losses due to the transformation of the inverter is avoided. The second may be a cheaper option if the pump already exists or if the available current is not perfectly suited to the needs of the Bulge. Solar pumps may be purely solar, ie, the pump will work exactly as solar energy provides kit, or aided by a generator or by the mains. The latest trend in existing pumping systems where utility grid power is used is to allow some degree of consumption with a solar kit in self-consumption mode, releasing part of the energy needed and reducing the need for pumping contracted power. The solar pumping, in all its forms, is one of the most cost-effective ways of installing a solar kit; because most of the consumption takes place during daylight hours and in some cases you can directly use cheap energy from solar panels without having to transform it to an investor. 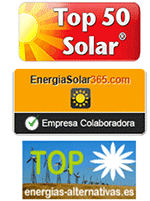 Thus, the cost of the energy supplied versus the cost of solar panels kit is maximized with respect to other systems. Currently, self-consumption installations of this type are allowing both to reduce consumption, and to reduce the contracted power. And since lately the price of receipt is accumulating in fixed terms, it allows to significantly reduce the total cost of the electricity bill.